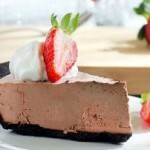 This Chocolate Pie Crust recipe uses a pie crust that is premixed. 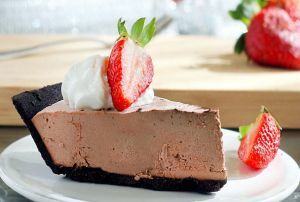 In a medium bowl, mix the pie crust mix, cocoa, and sugar together with a fork. Some white lumps will remain. Add the water and continue mixing. Pour the mixture onto a counter. Knead the mixture on the counter into a uniform ball. White streaks will remain—most will disappear as you roll out the dough. Roll the dough into a circle ten to eleven inches in diameter, enough to form the pie crust. Transfer the rolled dough to a nonstick, nine-inch pie pan—not deep dish. Trim and form the crust including a decorative edge that will act as a dam to hold in spills. Set aside. Note: A just-add-water pie crust mix is what professional bakers use to make great pie crusts without having to cut in butter or fat. If you want to save time or just have trouble making consistently good crusts, try this.